Photo. Liverpool supporters on the Kop, the famous section on Anfield, Liverpool home stadium. Liverpool was named as the fourth most friendly city to visit in the world (based on a poll, voted by readers of Rough Guide, 24.09.2014). The new results follow on from a survey earlier this year which saw Liverpool named number three in the world of the top destinations to visit. Liverpool is also a musical city. In 2001 the Guinness Book of Records declared Liverpool 'City of Pop' due to the many number one records to have emerged from the city. The most famous band to have come from Liverpool is The Beatles who played many of their early gigs at the Cavern Club. Between 1958 and 1964, the Merseyside area had about 500 different groups, which were constantly forming and breaking up, with an average of about 350 groups playing concerts on a regular basis (source: Wikipedia). Merseybeat is a light, highly melodic style of Beat Music popular in the UK during the early 1960s, named due to the abundance of bands from Liverpool beside the River Mersey. Merseybeat groups characteristically had simple guitar-dominated line-ups, with close vocal harmonies and catchy tunes. Some of these songs have been chanted at soccer matches at Anfield, Liverpool Football Club`s home stadium. Music and fotball go hand by hand. The enthusiastic singing there has an enormous affect on the atmosphere and makes the players perform far beyond their abilities. With such a passion among the supports they will be able to lift the club to big heights again. And nothing is better than sharing the success with the club when things go up again, and at the same time you know from the bottom of your heart that you have supported the club in bad times as best you could. It`s in bad times the club need their supporters most. This is a great little song to sing walking out of Anfield after a victory. Make sure to sing in front of opposing fans just so they know what's up. The world has ever seen." A collection of LFC terrace chants, anthems and songs - all sung by the greatest football fans in the world. Liverpool FC songs in MP3 for FIFA games to download free. 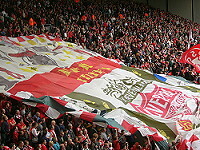 Liverpool FC football chants by LFC fans at Anfield, from FanChants. A wide range of chanting of supporter songs can be dowloaded from WIMP/TIDAL (Platekompaniet) and MyFreeMP3. Hear the supporters singing during Liverpool matches against Barcelona etc. This song quickly became the anthem of Liverpool Football Club after the release in the early 1960s and is invariably sung by its supporters moments before the start of each home game. The words "You'll Never Walk Alone" also feature in the club crest and on the Shankly Gate entrance to Anfield, their home stadium Anfield. The rock group Pink Floyd took a recording by the Liverpool Kop choir, and "interpolated" it into their own song, "Fearless", on their 1971 album Meddle. After the end of a concert by the rock group Queen, the audience spontaneously sang this song, according to guitarist Brian May, and this helped to inspire the creation of their songs "We Are the Champions" and "We Will Rock You" (source: Wikipedia). Many of these cover versions of this song can be downloaded from WIPM/TIDAL (Platekompaniet, Norway) and MyFreeMP3. I assume there must be over 100 cover versions of the song. The party version of the song is performed by the Slade in 2009: "Auld Lang Syne / You'll Never Walk Alone". And a slow, beautiful, stripped and talking version, performed like quoting a poem, is titled "Liverpool fans" - is available on MyFreeMP3. The story behind You`ll Never Walk Alone (article on BBC`s website). As mentioned has Liverpool been named the fourth most friendly city to visit in the world (based on a poll, voted by readers of Rough Guide, 24.09.2014). On Wikipedia you find a list of songs about Liverpool including songs as Penny Lane and Strawberry Fieds Forever from the Beatles. Read more about Liverpool on our global travel guide Travel Explorations.